Christmas quilts are a fine tradition, warming children on that Night of Nights while they wait for the wonders of the morn. Pine tree quilts, such as the inspiration for this mini-sock, were a common kind of Christmas quilt. NOTE: It’s Thanksgiving week in the US. This week I’ll be reprinting some great free projects from the past to set you up for Christmas stitching. In the meantime, I’ll be stitching away, getting ready for next week’s articles. This pattern is designed to use your scraps of green thread. Every tree uses a different thread. Th design is unified by the same thread for all the trunks and by the old-fashioned oatmeal color for the background. 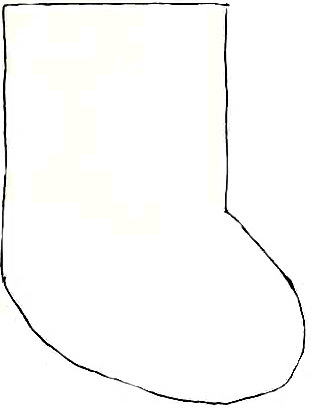 Using the mini sock outline (click for full size pattern), trace the ornament onto the canvas. This is the chart for the pine trees (sorry it’s the biggest one I have). It’s made from Diagonal Gobelins over three threads. The slant of the Gobelins reverses on each side of the tree. I found it easiest to stitch the top of a pine tree, then add the trunk and then move on to the next tree. There are six open threads between the trees. The background is Alternating Diagonal Gobelin Stripe over six threads. The stitch is done in columns with the slant of the stitch alternating. Cute! What a great project for a travel take-along. And who doesn’t have a variety of greens in their stash. Thanks.